The artist residency is a wonderful event in which artists get to go into an inspiring place and dance with the muses, don't you think? Residencies are one of the better ways to engage in artistic development and have uninterrupted dedication to the arts. 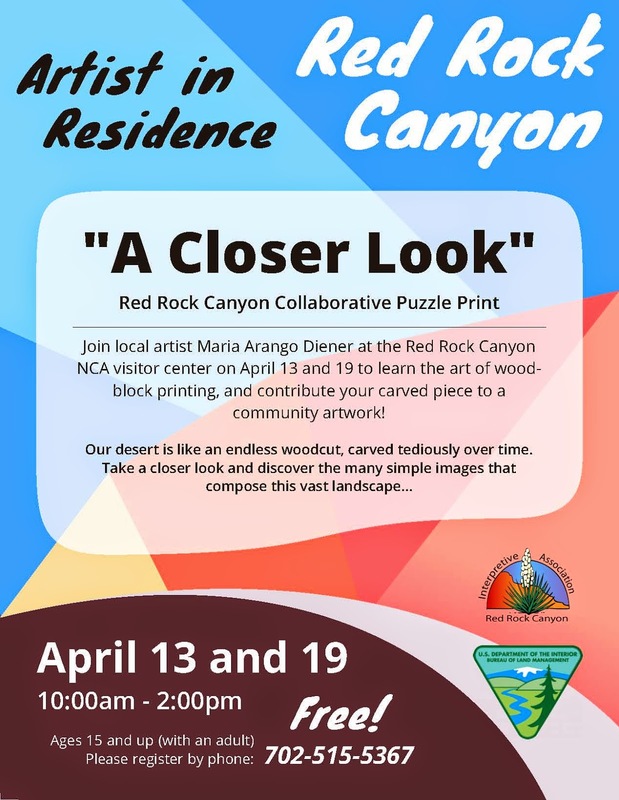 For all that I am grateful every day of this residency and truly thank the Red Rock Canyon Interpretive Association for affording me this unique opportunity. As you can tell, I'm having the time of my life. I have sketched now about 8 little blocks ranging form small to smaller and am planning a large piece or two. If you have visited my Facebook page (https://www.facebook.com/1000woodcuts), then you know I have enough reference material to last until next year. The desert in the spring is truly inspiring. Even if I had not signed an agreement that requires a donation and a workshop, I would be looking for ways to give something back. So, of course, I'm planning a puzzle print! Here is a sketch on two 16" x 20" panels, total size of the woodcut will be 16" x 40". I always print a few color and black and white photos to aid in the sketching. 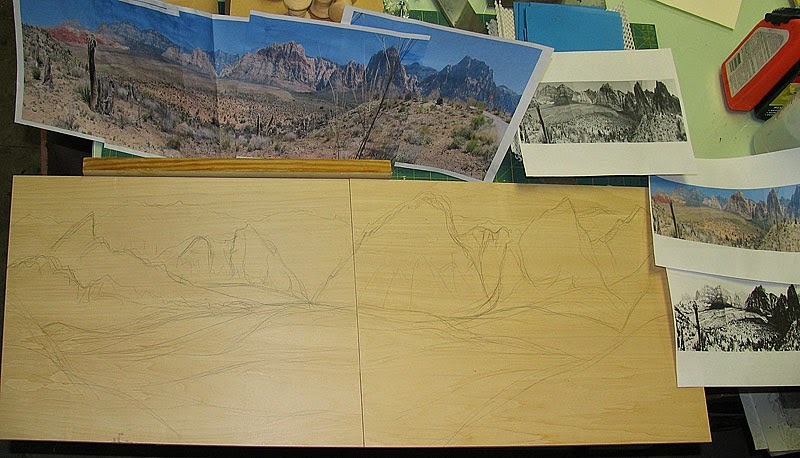 The plan being, I carve the background mountains, one of the most encompassing views of the Red Rock Canyon proper area. The puzzle pieces will reside inside the valley and will be carved by my workshop participants, which is the other way that I'm giving something back to the place that is giving me so much. I am going to place them in a quilt-like arrangement within the valley area, and will print all the tiny prints in one pass after gluing them securely. The background will be printed in another pass and I will probably hand color the resulting print (I have become enchanted with hand-coloring my woodcuts as of late!). The finished woodcut print and the block will be donated to my benefactors and will become part of the BLM/Red Rock Interpretive Association collection. How cool is that?! 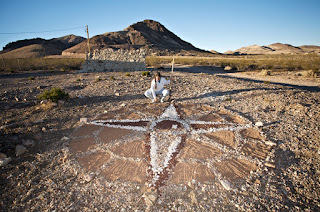 I am giving two workshops, one Sunday the 13th and another Saturday the 19th, which happens to be Red Rock Day! Info flyer at the end of this post. I spent the better part of yesterday and this morning assembling everything for my brave participants. 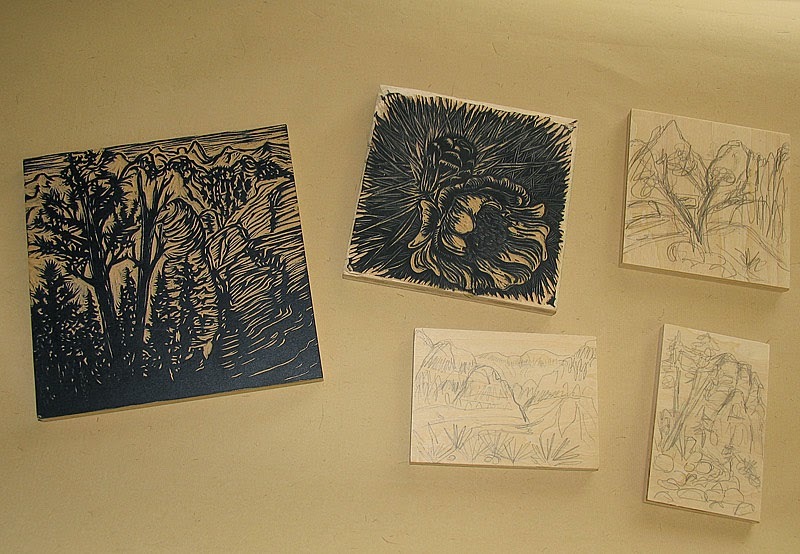 I like to provide everything so that everyone gets totally addicted to doing woodcuts. I use my own workshop instruction handout to make sure I have everything I need. 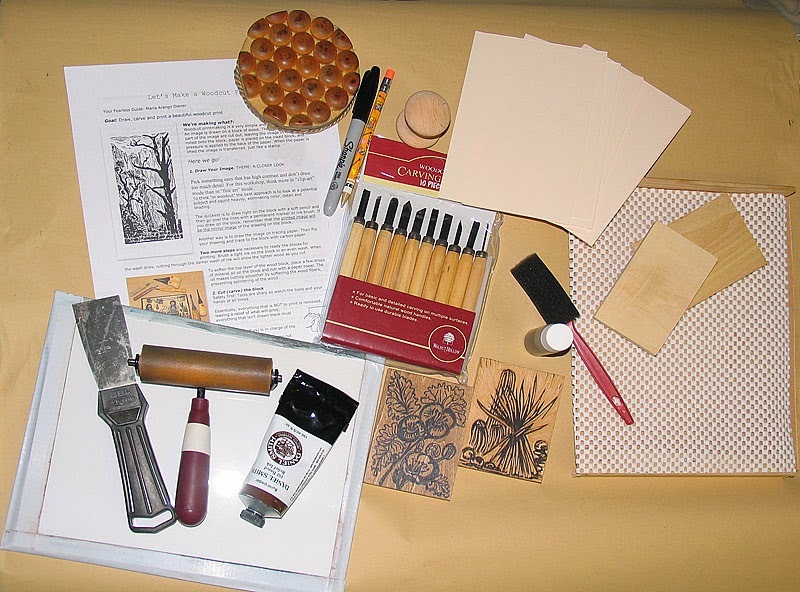 The woodcut kit is composed of: Starting at the top left and going clockwise: my handout with quick instructions, a printing tool I call a wood-button baren, pencil and marker for sketching, a door-knob printing tool, set of carving knives, paper for printing, woodblocks, a carving "bench" made of fiberboard and molding with no-slip lining, walnut ink for tinting the block and a foam brush, two demo blocks, ink slab (wax paper on foam board), ink, brayer and knife. Ready, set, go!